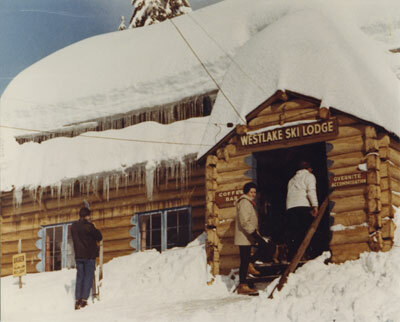 View of entrance to Westlake Ski Lodge with several skiers in front of building. Signs beside door read: coffee bar, overnight accommodation. Westlake Ski Lodge was located on Hollyburn Mountain. Scanned December 2011 using Epson Perfection V700 Photo at 300dpi and 100% of original image size. Alternate Versions: Lossless TIF from original scan at 300dpi and 100% of original print. W25 x H20 cm colour print on photo paper.